I foresee this thread taking a great journey to the land of P and C.
It's a spin-off of NSMike's thread about coming out. Specifically, Hypatian came out as transgendered awhile back, and a bit later I did, too. We kinda derailed it for pages and pages with talk about makeup and shoes and all that jazz, so Mike asked that we make our own thread. I'd really like for this thread to continue in the spirit of conversation and support that the other one did. I'd really hate to see it devolve into P&C bickering and semantic arguments. In my defense, I am all for posts seeking encouragement over the issues around coming out, and major milestones. That's the intent of the thread. And no need to be defensive, NSMike. Things did kind of go on for kind of a long time, sorry about that. This bickering is pointless. Lord Vader will provide us with the location of the Rebel fortress by the time this thread is operational. We will then crush the Rebellion with one swift, feminine stroke. Which is totally awesome, and I agree wholeheartedly with you that this conversation needed to move somewhere else. That's the intent of this thread. Happy to follow this discussion wherever it is. I just felt a disturbance in the force, like a million nerds getting a semi. I intend to hijack this thread over coming out as a gamer. I don't actually intend to do that. You want the other thread, then. This is the mascara one. and I thought this was going to be Catlin Moran slashfic. I'm sorry. I just spent a couple minutes trying to figure out what Optimus Prime had to do with this. Then I finally got it. Carry on, Pond. "Learning How to Be a Woman"?? So we have moved to a new thread where I can repeatedly look down at my hairy arms, legs, and back, and cringe everybody talks about doing waxing or using those demonic-looking epilady things. I will also say that that thread was the first time I've ever looked at my elbow and said, "You know, they're right, that would be a completely and utter b*tch to shave". Why are you shaving MilkmanDanimal's elbows? More importantly, why does he apparently not know about this? 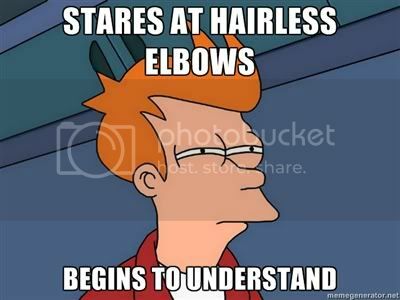 I'm a pretty hairy guy, and I'm more perplexed by the idea that elbows need to be shaved. Mine don't have hair on them. I'm a pretty hairy guy. Who's a pretty boy? NSMike want a cracker? Yeah, I guess maybe it's because I never have had need to, but I hadn't even thought about that aspect of things. The more you know and all that. Well, if you shave the rest of the arm and not the elbow, trust me, it's going to stand out. Therapy went well. My therapist is pretty sharp and narrowed in on some stuff I knew I was going to have to talk about eventually, but really didn't want to. Cathartic, and left me with a lot to think about. Hair pulling tonight is going to seem comparatively easy, I think. One nice thing about going gray is all the hair goes gray. I mean ALL of it. It's a lot less noticeable. Though gray eyelashes are weird. So I'll start off with the tips I guess! 1. If the thermostat ever goes below 70 degrees, you must quickly find a blanket and/or sweater and/or snuggie and/or large dog to lay on your lap lest hypothermia set in. Uh, all the hair? Oh boy. Y'all are inspiring me. I waxed my own eyebrows the other night instead of outsourcing it, since I still had a kit. Through a combination of epilation and tweezing, my upper chest is now hairless to a degree it hasn't been since puberty got its meaty hooks in me. I can't really articulate what this means to me, but... Um. Wow. It's like when I saw my arms without being covered in manly man arm hair, only way more so. Wow. I suddenly want to be on hormones a [em]lot[/em] more, and pray that they really reduce my body hair. Are you alone in your circle on this? What I mean is do you have other transgenders you can post questions to, share stories, etc. If that's too personal a question please disregard it.